We are quickly approaching the opening day and we still have a ton left to do. There are still several orders that haven't arrived and we are still building and painting shelves. Our goal is to have all of the shelves painted and in place by Thursday night so we can spend the entire day Friday stocking and cleaning. While the overall state of the store is still a mess, there are areas that are complete and we just look at those when we start to feel frustrated. 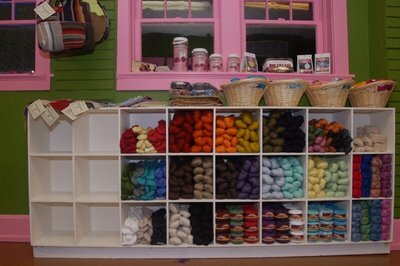 Last night I finished the vegan knitting section with the exception of the yarns that will arrive later this week. None of these yarns contain synthetics and all of them are absolutely beautiful. We are also carrying needle cases and knitting bags made from recycled materials, a perfect match for the large selection of environmentally and socially responsible materials we carry. We also met with Sarah Turner from Cricket Press and we will be selling a selection of the Cricket Press rings made by Julie Briggs. These rings are amazing and they come in little hadmade boxes. We only have five rings at this point, but we are hoping to add several more to our jewelry collection. wow, your store sounds and looks amazing - that picture makes me want to be the #1 customer! Good luck and congrats! 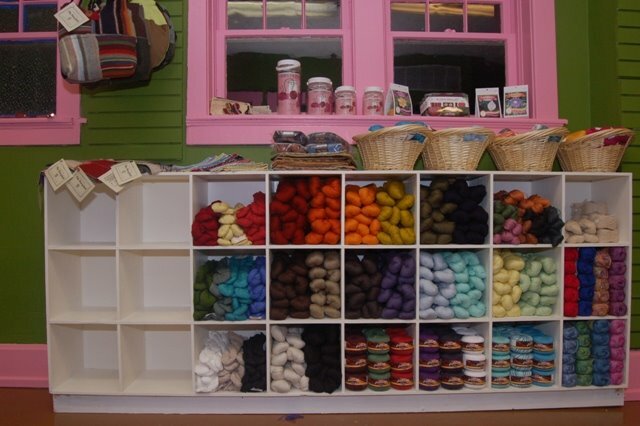 ooh vegan knitting section=killer! i bet there's some manos in there!!! i wish i could tell what's on those shelves!!! hooray! No manos yet, I just finished off the section with some Araucania bulky hand-dyed cotton. The stuff is amazing, I will be blogging about it later.